People go to Benihana Japanese restaurants as much for the food as they do for the entertainment value. Japanese chefs have mastered the ancient art of teppanyaki grilling over centuries. Today it is often mixed in with all kinds of other grills, but teppanyaki grills are something very specific, having to do with not just the grill itself, but the technique and style of cooking. Literally, teppanyaki means ‘grilled iron plate’ in Japanese but it is so much more than a simple iron plate. For starters, it is a flat, solid griddle, not grated like hibachi or barbecue grills. Unlike the latter, which use charcoal for heat, teppanyaki grills are heated over a propane flame while guests sit around the teppan chef in the center wowing them with his flipping and grilling skills. From its origins as a dining style for Japanese families, teppanyaki grilling made its way to America 200 years ago, becoming a fascination for diners to this day. Japanese steakhouses rely on teppan chefs to bring in the crowds for both cooking savory Japanese-style meals as well as their showmanship. What if we told you that you can have your own teppanyaki grill at home where you can get your Benihana on in the privacy of your own home? You can! And not just any grill will do. We found you the best 10 teppanyaki grills that you can buy right now. As for how to cook like a teppan chef…well…for that you need a class we think (or a kickass teppanyaki grilling cookbook – read through all the way to the end for more on that). For our money (and it is a lot of money btw), if you want to feel like a real teppan chef, the only way to go is the 3-in-1 Sit Around Flat Top Teppanyaki Griddle from My Hibachi BBQ. It is the best of the best. I mean look at it! It has everything you need! Not only do you get one of the best teppanyaki grills on the market, it sits center stage like you’re at a real Japanese restaurant. The table top and chairs fold out to provide seating and a place to dine around the grill. Heated with actual propane heat, this is as close to at-home authentic as you are going to get! In addition to getting your teppanyaki chef on, this grill is 3-in-1; meaning it converts from a teppanyaki griddle, to a BBQ grill, to a hibachi grill depending on what type of food you want to cook! This is by far our top pick among teppanyaki grills! If you are headed out to a Bring Your Own Teppanyaki Grill party, you are all set with the Portable Electric Teppanyaki Table Grill from Barbecue Frying Pan. Okay, so maybe there is no such party, but you can bring the party with you on a camping trip, barbecue in the park, or a cozy grill-tastic dinner at home. Totally electric powered, you can use this grill either indoors or outdoors. It runs on 1,200 watts with an adjustable thermostat. You can cook on the grill plate, or on the burners and the dual handles makes it easy to carry. Cleanup is a real breeze since the cooking surface is non-stick. Combined with the large grease pan, you won’t have to spend hours and hours scraping this grill when you’re finished with it. For versatility and portability, we highly recommend this teppanyaki grill. Maybe your dream isn’t to be a teppan chef at Benihana but you do want to be able to cook teppanyaki style Japanese cuisine. Well, in order to do that, you need a high quality teppanyaki grill like the Electric Teppanyaki Table Top Grill from Chefjoy. This set comes with accessories for cooking up all kinds of treats. There are the two non-stick egg rings for making perfectly round eggs. You also get a large grease tray for catching meat drippings, and this griddle comes with 6 wooden spatulas. One of the things every teppanyaki grill needs is a large enough cooking area for multiple meals. This gem is 35” x 9” big. The non-stick surface is super easy to clean too. All you need is a damp cloth to wipe it down after cooking. Showing off your teppanyaki grilling skills to friends and family will require a big griddle. That’s what we found with the Electric Teppanyaki Griddle Machine from Preeyawadee. This monster is bigger than your average indoor grill and it is lightweight for use indoors or outdoors. Cooking is easy with this grill. It uses a heating tube so that the heat is distributed evenly across the surface. It has a sloping design to allow grease to easily run-off and the non-stick surface makes cleaning up afterwards easy as pie. On top of being a teppanyaki grill, you can use this tool as a smokeless frying pan or a barbecue grill. However you want to use it, when you want barbecue for dinner in the middle of the winter, this is the machine that you need! One of our favorite indoor/outdoor teppanyaki grills is the 35” Electric Teppanyaki Table Top Grill from Costzon. Boasting an extra large surface, you can feed the entire family in one shot with this amazing griddle – perfect for when you want to use your grill to entertain. You get five different heat settings so that you can cook a variety of different foods including meats, fish, fried food, and veggies. Let the grease run off into the removable slide-out dip tray to enjoy healthier meals, even take it with you on a camping trip! 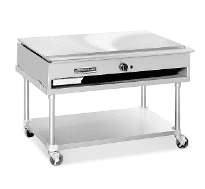 Safely transport this grill with the temperature controlled handles and anti-slip foot pads. In addition, it comes with two non-stick egg rings and six spatulas for authentic Japanese dining. To get the teppanyaki feel without the high cost, this one ain’t so bad! Of all of the grills we looked at, this design was the most intriguing. The Electric Teppanyaki Table Top Grill from Netsc19 is built on a tilt to allow for separate areas of the grill to cook at different temperatures. It also has raised edges to keep food securely on the grill plate. In order to accommodate the raised edges, the surface is extra wide giving you more cooking space. Cool touch handles make sure you don’t burn yourself while transporting it while on your camping trip. Plus you can cook anything on it! The non-stick surface handles fried foods and vegetables alike while cooking fish and meat that’s juicy and moist. If you are looking for a grill that can accommodate a party size crowd, this is the one you want. Next on our list is the 2000 watt Electric Teppanyaki Table Top Grill from Homesweet. This beauty is made for feeding the whole table! Notice how long the grill plate is. That is to accommodate a variety of different foods all at once. You can have your veggies on one row, your shish kabobs on another – classy! The grill plate itself, though thin, is almost an inch thick – able to retain a lot of heat; which is good because this simple electric grill gets nice and hot. It comes with an adjustable temperature control to make cooking different things a cinch. This grill comes with 6 wooden spatulas as well as two egg rings. Non-slip padding helps keep the legs in place while you chop and flip your teppanyaki dinner around. If you want a teppanyaki grill for entertaining, this one is pretty damn cool! Last but not least on our list is the Electric Teppanyaki Table Top Grill from Lolicute. This 1500 watt grill is basically a grated grill and a flat top in one. One side of the griddle has ridges for grilling burgers and steak while the fat top is good for chopping up chicken and fish with vegetables for a stir-fry. The heat control has five settings with auto power shut-off. This is a great griddle for family dining. It fits enough food to feed about six people. You can keep the grease to a minimum too using this non-stick grill with a grease tray on the side. If you are trying to save a few bucks but still want a high quality teppanyaki grill to practice on, we recommend giving this one a try. If you fail at teppanyaki, you can always just make pancakes on it! Our next pick wasn’t too hard to choose either. True grill masters know the American Range brand very well. They are the best at making grills of all kinds and it is no different with the TeppanYaki Griddle from American Range. This bad boy ranges in size from a 24” flat top surface for around $1,200 to a really big 72” griddle for close to $4,000 (stand is optional – price includes the stand). That’s a small price to pay if you are really serious about teppanyaki grilling! You can’t beat the quality of this grill. It’s a 30,000 BTU burner over a nearly inch thick steel griddle plate, protected by a super strong stainless steel exterior. For serious grillers who want to master the art of teppanyaki grilling, you can’t beat the quality of this grill. Every teppanyaki grill set should include certain items for true authentic, delicious Japanese grilling. We’ve narrowed it down to these 3 essential items for your teppanyaki grill. Some of the teppanyaki grills on our list come with cooking tools but none come with a complete set like the Teppanyaki Tools Set for Hibachi Grilling from Cuisinart. Americans often conflate the two – hibachi and teppanyaki. What we think of as hibachi is actually teppanyaki (the more you know!). 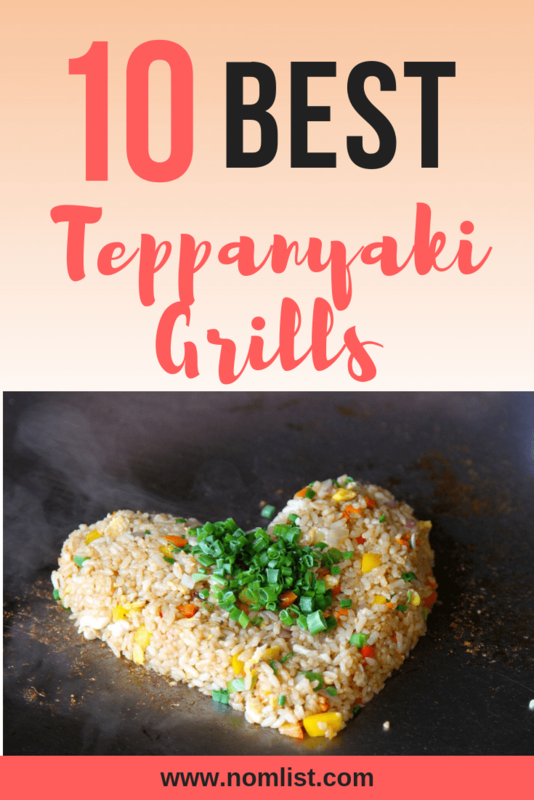 You get all 7 teppanyaki grill must-haves: a teppanyaki style knife (with sheath), a big stainless steel spatula, a meat fork, a wooden handled scraper, and at least two plastic bottles to hold your sauces, oils, or water. This set throws in a pair of non-stick egg rings to boot! Over time with a lot of use, your grill can become grimy, totally mucking up the taste of everything you cook. You can prevent that from ever happening by keeping this set of Heavy Duty Grill Scrapers from Shangpeixuan on hand. These professional grade scrapers can cut through any kind of stuck on grease or burned food that destroys good grill tops. This set comes with one aluminum grill scraper with four stainless steel replacement blades and a slant edge scraper with a wooden handle. If you want to get real good at Japanese cooking now that you own a teppanyaki grill, why not learn from the best? Written by Hideo Dekura, Teppanyaki Barbecue: Japanese Cooking on a Hotplate was released nearly 15 years ago and is still selling strong. It is worth all $40 to own this beautifully designed and gorgeously photographed cookbook. You get 80 incredible step-by-step recipes to help you master the art of Japanese cooking.